At the U.S. Conference of Mayors in San Francisco on June 5 (World Environment Day), 2005, two documents – the “Green Cities Declaration” and the “Urban Environmental Accords” – were presented. Every mayor in attendance signed them, and because of that, every citizen in America is threatened. The elected officials have signed on (knowingly or not) to the destruction of property rights and the U.S. Constitution, and now individual citizens must arm themselves with the knowledge of the problem, educate their fellow citizens, and take back their cities. With knowledge about Green Cities and Sustainable Development, we are going to be the solution. At the U.S. Conference of Mayors in San Francisco on June 5 (World Environment Day), 2005, two documents – the “Green Cities Declaration” and the “Urban Environmental Accords” – were presented. Every mayor in attendance signed them. Because of that, every citizen in America is threatened. If the cities achieve the goal of implementing three actions each year from 2005, they will have completed their 21 Actions in the seven years leading up to June 5, 2012, the date of World Environment Day. And what exactly will each city have achieved by then if they have completed each of the 21 Actions set out in the Green Cities/Green Mayors plan? They will have received 21 green stars. That’s it. Besides being in deep debt and having taken away their citizens’ rights along with their property. While the website for Green Cities touts cost savings, jobs creation and happy citizens, the reality is just the opposite. Seven areas that comprise three actions each make up the 21 “practical” actions called for in the Accords. The seven areas are energy, waste reduction, urban design, urban nature, transportation, environmental health and water. Urge their state governments, and the federal government, to enact policies and programs to meet or beat the greenhouse gas emission reduction target suggested for the United States in the Kyoto Protocol – 7% reduction from 1990 levels by 2012. Urge the U.S. Congress to pass the bipartisan greenhouse gas reduction legislation, which would establish a national emission trading system – Waxman-Markey. Since that meeting in 2005, the total number of U.S. mayors to sign on has passed 900. But because not every mayor in every city has not yet signed on to Green Cities, local citizens are asked to take charge of the project for their cities and move them forward. Some mayors have turned down the offer of being a “Cool Mayor.” One suggests that the program “appears likely to lose its way and simply redistribute wealth in the state.” Whoa, that mayor can read between the lines. A columnist in Michigan wrote that, “While some may argue that it is logical to provide this type of funding (the program offers $100,000 ‘catalyst grants’ to big cities while offering small towns matching grants) to larger cities, it is important to remember that past state and local government efforts to stimulate economic growth in larger cities have failed. . . . The governor’s attempts to revitalize Michigan’s economy through the Cool Cities initiative might seem honorable, but it is ironic that the state is handing out hundreds of thousands of dollars in dubious grants at a time when legislators are debating the per-pupil funding for schools, money for higher education and restraining Medicaid benefits. It should shift its focus to providing a secure environment that is open to new business by restructuring the single business tax, rationalizing its regulatory environment and removing other roadblocks to economic development.”1 So at least one person in Michigan sees where this is going. Calling for cities to increase renewable energy to meet ten percent of the city’s peak electric load within seven years expects a lot from the cities and even more from renewal energy sources. The cities will have to fork out a lot of money to provide that much renewable energy because it is still prohibitively expensive technology. And where are they going to install the equipment needed to produce this energy? On every roof in the city? And in public parks? And on baseball, football and soccer fields? Where do they expect to find the other 100+ acres they will need? As to Waste Reduction, the mayors are told to establish a policy to achieve zero waste to landfills and incinerators by 2040. One must assume that the United Nations knows something we don’t — like the technology to achieve this will be invented in the very near future. Skipping down to Environmental Health, our mayors are told that every year they must identify one product, chemical, or compound that is used within the city that represents the greatest risk to human health and adopt a law and provide incentives to reduce or eliminate its use. Cities already ban those things that are deleterious to the health of its citizens, so how are they to find things to ban? The Supreme Court just decided that carbon dioxide is a pollutant. Humans breathe out carbon dioxide, in fact breathing produces approximately 2.3 pounds (1 kg) of carbon dioxide per day per person. I guess the cities could begin by banning people to achieve the Environmental Health goal. And when these cities have banned three products a year for so many years, they will eventually have to start banning good things. In fact, most cities will run out of actual things to ban in the first year. Will they then emulate Anchorage in the ’90s when the EPA mandated that all water districts remove a certain percentage of pollutants from their water supply? Because Anchorage’s water was so clean naturally, they had to dump the refuse from fish canneries into the water so they could turn around and remove it in order to comply with the EPA mandate. So where does all this anti-human nonsense come from? Why would anyone, any mayor, want to afflict their community with destruction of property rights, while reducing energy consumption and simultaneously raising the cost of energy? At the beginning, I referred to the source of the threat to our way of life, the United Nations’ Agenda 21. The growth of world population and production combined with unsustainable consumption patterns places increasingly severe stress on the life-supporting capacities of our planet. These interactive processes affect the use of land, water, air, energy and other resources. Rapidly growing cities, unless well-managed, face major environmental problems. The increase in both the number and size of cities calls for greater attention to issues of local government and municipal management. The human dimensions are key elements to consider in this intricate set of relationships and they should be adequately taken into consideration in comprehensive policies for sustainable development. Population policy should also recognize the role played by human beings in environmental and development concerns. There is a need to increase awareness of this issue among decision makers at all levels and to provide both better information on which to base national and international policies and a framework against which to interpret this information. 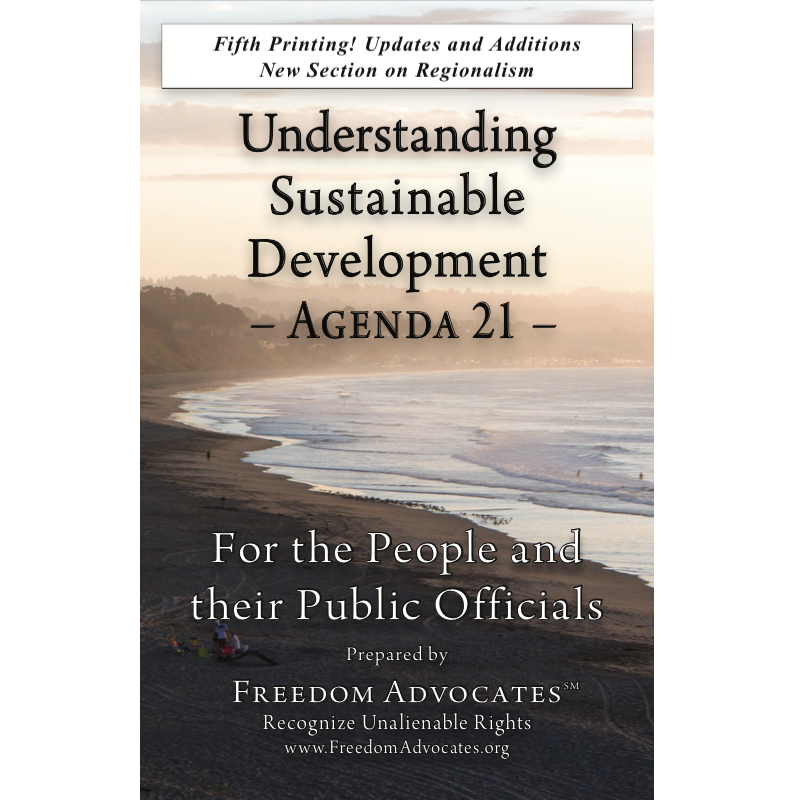 So we have the “information on which to base national and international policies and a framework against which to interpret this information.” Agenda 21 mandates all of this and more. They rail against the number and size of our cities while at the same time they are rounding us up from the suburbs and rural areas and cramming us into the cities so the land we now occupy can “go back to its natural state” (read: without human presence debasing its perfection). Then note the hint at population policy – that the teeming multitudes (us) they have forced into the cities must be culled. But they haven’t directly – yet – told us how the will handle that problem. One has to wonder if any of the mayors and city legislators truly comprehend what they are seemingly so whole-heartedly endorsing. If they do, they must understand that they are destroying their cities; businesses will close and residents will loose their homes, thus the tax base will dry up. A city cannot survive without the taxes derived from businesses and property owners. So how will these mayors survive? Do they have buried gold? Or have they thought that far ahead? And do they realize that their positions are to be taken over by non-elected entities connected to the U.N.? If the mayors do not understand what they have signed onto, if they have stuck their heads in the sand and gone along for the sake of political correctness, they deserve what they get but their constituents do not. This brings it all down to the lowest common denominator, the citizen. Because the elected officials have signed on (knowingly or not) to the destruction of property rights and the U.S. Constitution, Joe and Jane Doe have to take it upon themselves to correct the situation. They must arm themselves with the knowledge of the problem, educate their fellow citizens, and take back their cities. We are the Joe and Janes. With knowledge about Green Cities and Sustainable Development, we are going to be the solution. 1 Vanessa C. Ferguson, The Price of Cool. 2 Driessen, Paul “Unable to See Wind’s Deficiencies for Forests of Concrete and Steel,” Investor’s Business Daily, July 28, 2009. 3 In addition to the U.S. Conference of Mayors, a number of NGOs (non-governmental organizations working in concert with the U.N.) are actively working on the Cool Cities/Cool Mayors project. They are ICLEI, the Sierra Club, Climate Solutions, Natural Resources Defense Council, Kyoto USA, the Climate Crisis Coalition, and the Virtual March. Action 1 Adopt and implement a policy to increase the use of renewable energy to meet ten per cent of the city’s peak electrical load within seven years. Action 2 Adopt and implement a policy to reduce the city’s peak electric load by ten per cent within seven years through energy efficiency, shifting the timing of energy demands, and conservation measures. Action 3 Adopt a citywide green house gas reduction plan that reduces the jurisdictions emissions by twenty five percent by 2030, and which includes a system for accounting and auditing greenhouse gas emissions. Action 4 Establish a policy to achieve zero waste to landfills and incinerators by 2040. Action 5 Adopt a citywide law that reduces the use of a disposable, toxic or non-renewable product category by at least fifty per cent in seven years. Action 6 Implemented “user-friendly” recycling and composting programs, with the goal of reducing by twenty per cent per capita solid waste disposal to landfill and incineration in seven years. Action 8 Adopt urban planning principles that advance higher density, mixed use, walkable, bikeable and disabled-accessible neighborhoods which coordinate land use and transportation with open space systems for recreation and ecological restoration. Action 10 Ensure that there is an accessible park or recreational open space within half-a-kilometer of every city resident by 2015. Action 11 Conduct an inventory of existing canopy coverage in the city; and then establish a goal based on ecological and community considerations to plant and maintain canopy coverage in not less than fifty per cent of all available sidewalk plating sites. Action 12 Pass legislation that protects critical habitat corridors and other key habitat characteristics (e.g., water features, food bearing plants, shelter for wildlife, use of native species, etc.) from unsustainable development. Action 13 Develop and implement a policy which expands affordable public transportation coverage to within half-a-kilometer of all city residents in ten years. Action 14 Pass a law or implement a program that eliminates leaded gasoline (where it is still used); and that phases down sulfur levels in diesel and gasoline fuels, concurrent with using advanced emission controls on all buses, taxis, and public fleets to reduce particulate matter and smog-forming emissions from those fleets by fifty per cent in seven years. Action 15 Implement a policy to reduce the percentage of commute trips by single occupancy vehicles by ten per cent in seven years. Action 16 Every year, identify one product, chemicals, or compounds that is used within the city that represents the greatest risk to human health and adopt a law to provide incentives to reduce or eliminate its use by the municipal government. Action 17 Promote the public health and environmental benefits of supporting organic foods. Ensure that twenty per cent of all city facilities (including schools) serve locally grown and organic food within seven years. Action 19 Develop policies to increase adequate access to safe drinking water, aiming at access for all by 2015. For cities with potable water consumption greater than 100 liters per capita per day, adopt and implement policies to reduce consumption by ten per cent by 2015. Action 20 Protect the ecological integrity of the city’s primary drinking water sources (i.e., aquifers, rivers, lakes, wetlands and associated eco-systems). Action 21 Adopt municipal wastewater management guidelines and reduce the volume of untreated wastewater discharge by ten per cent in seven years through the expanded use of recycled water and the implementation of sustainable urban watershed planning process that includes participants of all affected communities and is based on sound economic, social, and environmental principles. Kathleen Marquardt is the author of “AnimalScam: The Beastly Abuse of Human Rights” and founder of Putting People First. She has testified before state legislatures, appeared on national television, spearheaded opposition to legislative initiatives, become involved in lawsuits and spoken to thousands all across the country.